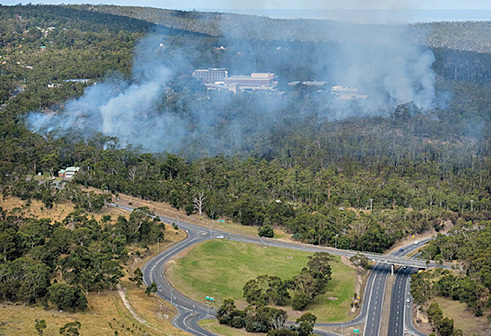 Fuel reduction burning is the most effective method of reducing bushfire risk in Tasmania; however any fire will generate smoke. Smoke can cause health issues for people suffering from asthma and other respiratory illnesses, so how is smoke from fuel reduction burns planned for and managed? Many factors influence smoke, including land topography, likely wind direction, vegetation dryness and air temperature, and these are all considered when planning fuel reduction burns. Fuel Reduction Unit staff consider where smoke is likely to go and if roads, agriculture, community events or population centres could be affected. Bureau of Meteorology weather products are also reviewed and monitored before the burn, on the day of lighting up and throughout the burning period until the burn is complete. Environment Protection Agency air quality monitors are also checked throughout an active burn. FRU staff also coordinate each burn with landowners, notify neighbours and the community about the proposed burn. One or two days before the burn is lit the FRU notifies a large group of stakeholders including all Tasmanian media, the Department of Health and Human Services, AsthmaTas, the Environment Protection Authority, Wine Tasmania, Tasmania Police, Mineral Resources Tasmania, the Parks and Wildlife Service, Forestry Tasmania and relevant districts of the Tasmania Fire Service. These notifications are also put on Facebook. This is to ensure the community is aware that a burn is occurring and there will be smoke. A burn will only go ahead if the wind and air temperature create the right conditions. Also the FRU monitor the weather conditions throughout the days of the burn, in case smoke alerts need to be issued to the community and also to ensure the burn is conducted safely. 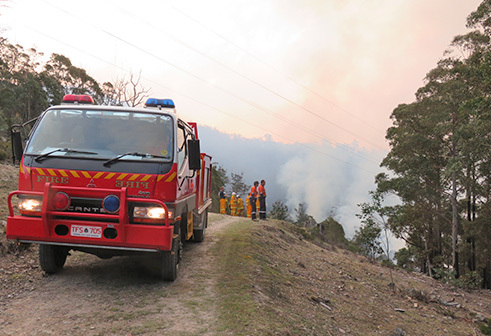 Another part of smoke management is Tasmania’s Co-ordinated Smoke Management Strategy (CSMS) which is organised by the Forest Practices Association. The FRU (as part of the Tasmania Fire Service) participates in this and other participants are the Parks and Wildlife Service, and the forestry industry. Each participant supplies a bid or estimate to the CSMS of how many smoke units they expect their burn to generate. The CSMS monitors what burns are planned where, to ensure that no particular area (called an air shed) is having too much smoke on any day. The CSMS puts a cap on the number of burns which can occur on any day and this can change daily because of forecast weather conditions. The participants get an allocation of how much smoke they can put up in their burn which is measured on the size of the burn and the type of fuel to be burnt. The Environment Protection Authority monitors smoke throughout the day.